Box Text: The rolling, sticking, never-stopping, ever-swelling clump of stuff that makes a star out of everyone and everything. When the King of All Cosmos accidentally destroys all the stars in the sky, he orders you, his pint-sized princely son, to put the twinkle back in the heaves above. How, you ask? By rolling everything and anything on Earth into clumps, so he can replace what's missing in space. 01-22-2015 desocietas Box Text The rolling, sticking, never-stopping, ever-swelling clump of stuff that makes a star out of everyone and everything. When the King of All Cosmos accidentally destroys all the stars in the sky, he orders you, his pint-sized princely son, to put the twinkle back in the heaves above. How, you ask? By rolling everything and anything on Earth into clumps, so he can replace what's missing in space. 12-28-2012 foxhack Box Text The King of All Cosmos accidentally destroyed the stars and, having recovered, wants the prince to rebuild them. Unfortunately the prince stands a little less than half a foot tall, so recreating the stars will require some effort. 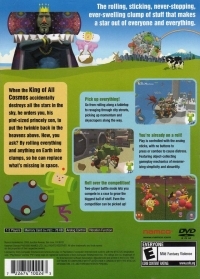 Enter the Katamari, a sphere the prince can push around our world to "roll up" items increasing the Katamari's size until it's suitable for the King. 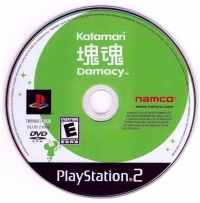 This is a list of VGCollect users who have Katamari Damacy in their Collection. This is a list of VGCollect users who have Katamari Damacy in their Sell List. 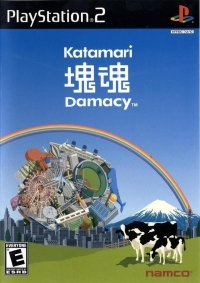 This is a list of VGCollect users who have Katamari Damacy in their Wish List.